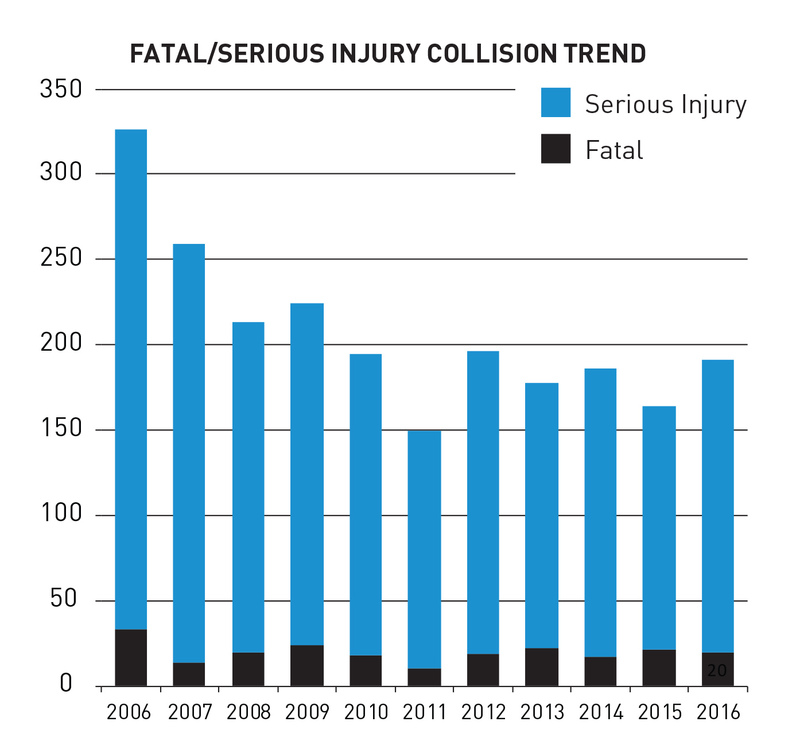 As Seattle works toward Vision Zero, data from SDOT’s annual traffic report found that collisions with fatal or serious injury jumped 16.5% in 2016, even as traffic volumes remained nearly unchanged. In early 2015, the city launched its Vision Zero initiative with the goal of ending all traffic deaths and serious injuries by 2030, with serious funding beginning late in 2016. 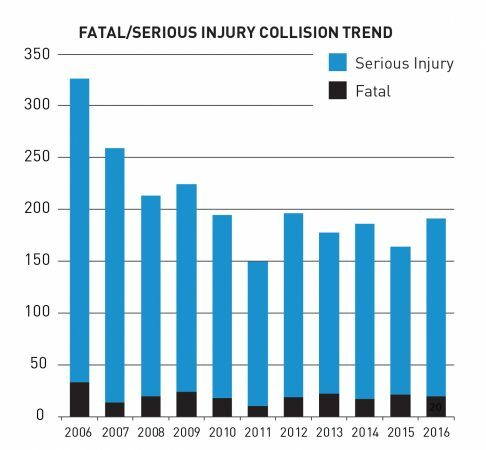 The number of crashes with fatal or serious injury has remained relatively consistent over the last seven years after a big drop during the last recession (see chart). 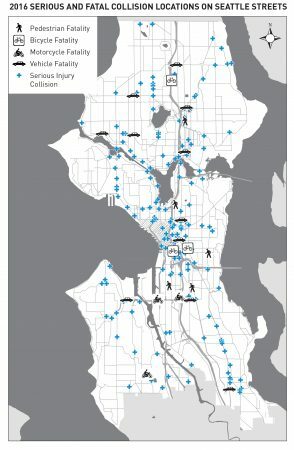 Of the 20 deaths on Seattle’s streets in 2016 (down one from 2015), five were pedestrians, three were bicyclists, three were motorcyclists and nine were in vehicles. Exceeding the speed limit was cited as the cause of at least six of the fatalities, with driving under the influence and “unknown driver distraction,” each contributing to at least three deaths. Though drivers mostly hit other vehicles, parked and moving, a total of 553 pedestrians and 440 bicyclists were hit last year — 87 of whom were seriously or fatally injured. Padelford said people walking make up a disportionate percentage of the fatalities. According to SDOT, while bicyclists and pedestrians are involved in only 6.3% of all crashes, they represent a much larger percentage of the serious (47.4%) and fatal collisions (39.7%). In 2016, collisions involving pedestrians increased 6% over the previous year, the highest number of pedestrian-involved collisions since 2006. Two-thirds of these incidents occurred at intersections (as opposed to mid-block). In over half of the incidents, the pedestrian used a marked crosswalk. According to SDOT’s Jim Curtin, who oversees the planning and implementation of Vision Zero, the plan was not funded its first year. The passage of the Move Seattle levy in 2016 provided funding, so the data doesn’t reflect Vision Zero funding at all. Curtin said that looking at the number of injuries or fatalities, rather than collisions ,shows a different picture. Using that metric, the number of fatal or serious injuries from collisions decreased 4% between 2015 and 2016. This data was not included in the traffic report, but according to Curtin, the total number of severe injuries or fatalities dropped from 224 in 2015 to 216 in 2016. Pointing to improvements made in 2015 along Rainier Ave South, which decreased annual collisions from 87 to 49 and all injuries there by 40 percent, Curtin said the data shows streets recently redesigned are experiencing a significant reduction in crashes. Curtin said SDOT’s work has bucked the national trend of substantial increases in death and serious injury over the past three years. “Where we’ve been able to intervene, we’ve had positive results,” he said. SDOT anticipates releasing an update to the Vision Zero work plan by mid-2018. Curious about the years before 2006. Was that a spike? And what brought 2011 that low? Also very interested in the details of all these accidents, especially the fatal ones. Any ideas? There’s a pretty large spike in 2003-2006. Then it drops down again until the mid-90s. SDOT has a habit of including as much historical data in these graphs to ensure that they have a downward sloping trend line. For the past few years, they’ve just included 9-12 years of data. Before that, they had to include 20 years to get that trend line. That graph going back to ’92 is from the 2011 Traffic Report. These statistics are ignoring population and employment growth in Seattle. They should be adjusted to be presented on a per capita or per 100000 people basis. Normally this isn’t important but given our 15.7 percent population growth from 2010 to 2016 is affects the data. They do include collision and fatality rates, but it’s.. sloppy. Looking at the traffic report (linked from the article): page 24 has the citywide collision rate graph, which has the number of collisions per average daily traffic (a rough estimate of miles driven). Later, on page 27, they look at the pedestrian collision rate, which they consider the number of pedestrian collisions per 100,000 residents. Why the different denominator? Who knows. When I wrote https://www.theurbanist.org/2017/08/31/rainier-ave-road-diet-data/ , I found quite a few errors in SDOT’s data. Overall, it’s very worrying. I’ve wondered if blanketing the city with so many speed reduction treatments is better than only focusing on the places where safety is a bigger problem. Reminding a driver to pay attention more at an intersection or short segment could lose its benefit when that reminder runs for several miles. Sure, more geography is made safer but the true danger points become less prominent. I know someone who works in transportation and she said that the way the city just lowered the speed limits from say 40 mph to 30 mph on 15th Ave is really amateur or political when it comes to vision zero. There’s historical evidence all over that drivers will just violate the speed limit if they feel that going that speed doesn’t feel right. So that’s why you take 15th Ave today and it’s still 30 mph but people still drive it at 40 mph. This isn’t unique to Seattle or anything, I’ve seen this on streets in other cities where they just lower the speed limit to “calm” it. The problem is speed limits don’t really change driver behavior at all. In fact it’s the weakest option in the bag. You need to reduce lane width, add speed bumps, or look into other options to change the actual roadway if you want to reduce speed in a corridor. The really odd part is that there’s no way that SDOT doesn’t know this. That’s why I believe the lowering was political and looked at as a quick way to score points. I’m guessing a certain mayor that liked to appear like he was solving problems was the source. Jon, let’s take this a step further. Can you see a time coming when a car-free, transit-rich commercial district will be more profitable than the car- saturated ones we have now? Because when the pointers cross on that one, car traffic itself will provide all the barrier you need against any transit speed at all. And freedom itself, including shopping will only exist where people can walk and take transit. The city pointed to studies that lowering the speed limit reduces fatalities. The city is generally reducing speeds on arterials from 30 to 25 and on non-arterials from 25 to 20, so it’s only a 5 mph difference, not 10. The only streets I know of with 40 mph are parts of Aurora and Sand Point Way. 15th may get up to 40 north of 65th but I doubt it. And it’s not doing all arterials as a blanket step; it’s evaluating each one. I’m especially concerned about MLK because the Link signal priority is based on both Link and cars going 35 mph. If you slow down Link it makes travel time longer and rapid transit a mockery, but if Link goes faster than the cars it means they want different signal times and complicates cross traffic. So I really hope they leave MLK alone. A train traveling on tracks, operated by a skilled driver should not be compared to normal vehicles. I see now reason why they would need to lower the speed limit for Link if the limit is lowered for cars. The only way to really accomplish vision zero is to install speed and red light cameras all over the city. Once you get driver compliance into the upper-90% range, you can really start affecting average speeds. There’s a city ordnance that surface light rail must run at the same speed as the adjacent car lanes, so it would need an exception to that. Having a different speed between Link and cars also throws Link’s signal priority out of whack or at least makes it more complicated. With the same speed limit they both reach the lights at the same time so you can just have a series of greens that works for both. With different speed limits you have to balance the needs of Link, the parallel cars, and the perpendicular cars. And whenever car thoroughput or car congestion is affected, it’s hard to get departments of transportation to put trains completely first. So having two factors instead of three means Link’s priority will probably be better. “Green waves” don’t really work on two-way streets like MLK. You can’t really give both directions green waves without significantly affecting cross-traffic. In Portland, MAX has ultimate signal priority on East Burnside Street. Vehicle traffic is not considered. Additionally, the signed speed limit for drivers on Burnside is 30mph, and MAX’s speed limit is 35mph. It all works just fine. If your DOT is forcing LINK to match the speed of cars for supposed technical reasons, you are all being duped. Absolute signal priority and then a longer signal afterwards to clear the cross traffic. That’s how freight trains have done it for decades. In over half of the incidents, the pedestrian used a marked crosswalk. And what do the statistics say about the disposition of any cases filed against the drivers in these “incidents”? Specifically, what were the dispositions of the cases involving the death of the pedestrian? Even more specifically, how many of the drivers who were not “incapacitated” were charged with vehicular homicide? I would bet that the number is zero! Well, as karma recompense for complaining about drivers running pedestrians in cross-walks down, I guess, my wife and I almost got hit this evening, in a marked cross-walk on a secondary arterial. Grant, it’s in Vancouver, not Seattle, but the drivers are recognizably the same; they have the same plates at least. We started crossing what is essentially a two lane street with narrow parking strips with a car about a block and half away. The lighting isn’t great, but the guy had his brights on so he had to have seen us. The car was going about 40 in a 35 zone, but that’s not uncommon on that particular street. One would expect that car to start slowing since it would be pretty darn close to us when it passed if it didn’t. But it didn’t and it was. It passed about three feet behind us at 40 miles per hour not having slowed in the slightest. And the autoistas wonder why we hate them. I’m a fan of the Rick Steve’s method. Vancouver drivers are fairly terrible when it comes to pedestrians. In Portland, we learn to fear Washington plates. Partially to blame is the influx of people from regions of the country/world where dangerous driving is the norm. Partially to blame are cars getting faster and more cut off from the world around them (sound proofing, tinted windows, etc). Partially to blame is our archaic road system and political thinking that vastly favors cars over everything else. This problem will not go away with hand-waving, good intentions and paint. Until Seattle and SPD get serious and actually start enforcing traffic laws, I can only see this getting worse. Road diets and physical reconstruction/rechanneling of roads definitely help, but as the summary states, these measures are significantly underfunded, with decades of work backlog. Enforcement is likely also significantly underfunded. I wonder much (or whether) the PD’s traffic enforcement staffing and funds has been increased since the recession. It seems that the only way to really keep up is to use 21st century technology–camera enforcement, both at intersections and mounted on patrolling squad cars. (OK, it’s really late 20th Century tech). The R’s in the Legislature (and far too many “Democrats”) won’t stand for camera enforcement. They’d rather slaughter urban pedestrians. Fewer Blue voters; what’s not to like? Partially self-funded enforcement (with appropriately scaled fines versus income as has been shown to work elsewhere) might work. After doing the arithmetic and dialing in enough self-support traffic fines would doubtless become somewhat more of a true deterrent. Of course this would require complete and utter transparency so that folks couldn’t justify their inner 6 year old by hypothesizing conspiracies to fleece drivers, etc. But easily doable, technically speaking, not that there’s any political courage available (aka leadership) to even moot the idea. People are so emotional (infantile, really) about driving that it’s political dynamite to consider serious traffic law enforcement. Best way to reduce the collision rate: PROMOTE TRANSIT, RIDE TRANSIT AND MORE TRANSIT, MORE PLACES, MORE OFTEN. This is due to a few things. (1) They’ll give any idiot a driver’s license; the tests are minimal. Most US drivers would flunk a UK driving test. (2) They won’t revoke driver’s licenses even for repeated reckless driving. Most motor vehicle crashes are committed by repeat offenders, but they’re still allowed to drive! (3) Drivers’ education was eliminated from schools in roughly 1995. Add these together, and you have an ever-worsening population of essentially untrained drivers on the road. And the reasons for (1) and (2) are because land use and limited transit makes many people dependent on a car to get to work or the store or doctors’ appointments. So we could, gasp, make cities more walkable and put people and destinations closer together and provide transit like the UK, and then it would be easier to raise driving standards without causing a major political backlash. Almost there, Nathanael. But a few finishing touches. Put (4) In front of word “Add”. Put (5) in front of final summary: Traffic police trained to recite the following: “We’re sorry our signage isn’t clear, sir, or ma’am. You’ve gotten into a business district. On your point, Mike, this is something I’ve been thinking about for a very long time. The best work tool of my life was an articulated trolley-bus. Studied the handling of those machines every minute- every maneuver, every change of speed. Still furious our Tunnel fleet was world’s worst equipment- which I still drove by choice only because I was proud of starting a railroad with buses, and owed it to union majority not to make them drive a Breda. My life’s only recreation is now my car. Closest sport would be rally driving. Point is control of the car, not speed. Freeway-free. Two lanes, lot of hills and curves. Not a mile over speed, or ten seconds slowing following traffic. Google up “Paris Pike”- road specifically designed for this kind of driving. Not trucks, cannons, and military freight, like the Interstates. Life goal: open cup on the dash. Would vote for a driving test I could pass on fifth try. So willing to pay taxes both the necessary highway system, and the transit for daily urban life, Also enough so average transit passenger can afford to drive- if they can prove their skill. Because to me, this is what an automobile is for. I don’t plan to live to drive it- but also wouldn’t plan not. Force for change won’t be environment, fuel, or pedestrian comfort. It’ll be because we’re swiftly approaching time when absolutely nobody in a car can move out of the garage. Let alone able to stand being in the driver’s seat. So Nathanael, you’re headed in the right direction. You’ll get your permit third try. There is an increase in the number of serious accidents this year, but that looks like just random fluctuation to me. There was a solid decrease since 2006, but things have leveled off since then. A more accurate headline would reflect this (e. g. Collision Rates Level Off, After Making Progress”). I just finished reading the report and skimming most of the data tables and have a couple of questions? 1. Why are taxi cab boardings included in the transit ridership numbers. 2. What is the capital and operational costs for the permanent bike counters?